I might as well make it explicit: I have been baking my way through Michael Ruhlman's book "Ratio: The Simple Codes Behind The Craft of Everyday Cooking". It's high time I brought my Rookie Cookery readers in on the fun. Because this is a site for Rookie Cookery, you will rarely find exotic ingredients, complicated procedures, or fussy recipes here. What you will find are simple and straightforward recipes and techniques that will yield consistently delicious and satisfying results for the dinner table-- and the dessert plate too. My favorite cook books tend to be those that teach me not only a recipe, but a theory and an approach to food and cooking that allow me to cook from memory as much as possible, as well as allow room for elaboration and improvisation. In short, to go from "open minded rookie" to become a Competent Home Cook (or CHC for short). Michael Ruhlman's "Ratio" is just such a book. Here you will find the tried and true ratios of ingredients that, once understood and employed, will yield consistently good results for certain classes of baked goods (and some sauces as well). Practice the ratios in this book, I reason, and one is well on the way to creating the foundation of a lifetime of excellent baking and cooking. So today, it's all about the pound cake ratio! 1 part butter, 1 part sugar, 1 part egg, 1 part flour. NOTE: For best results and a true 1:1:1:1 ratio of ingredients, these are measurements by weight, not volume. (Buy a scale. It's important). The method of combining ingredients is also important, and Ruhlman points out that the same ratio of ingredients, combined in a different order, will yield sponge cake instead of pound cake. More on that story later. First weigh out all your ingredients. Cream together the butter and sugar until the mixture is lighter in color and increases in volume by one third. Mix in eggs slowly, being careful not to over mix. Add fruit juices and vanilla. Add in flour slowly, mixing until incorporated. Pour into buttered pan and bake for one hour at 325 degrees F. or until cake tests done. Dress it up with a drizzle of citrus glaze (2 tablespoons of lemon or lime juice mixed with 1/4 cup confectioner's sugar), macerated and sweetened fruit, or a dusting of powdered sugar. Commit this ratio to memory and you'll always have something sweet to snack on from the staples in your pantry. Just for fun: Here's a variation on pound cake made with Sprite soda pop by Pioneer Woman! 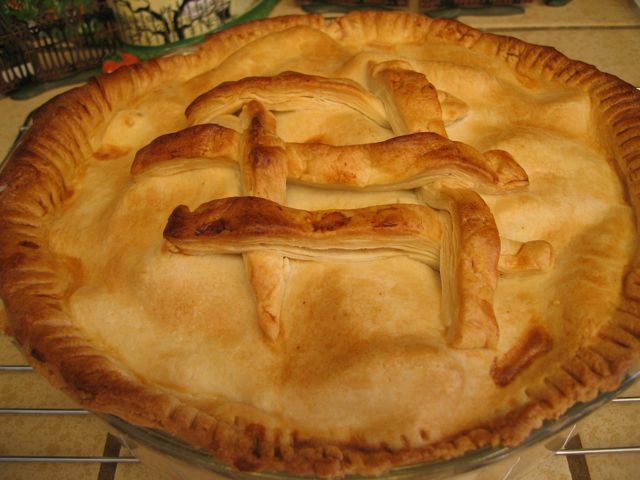 How do you like my fake lattice crust on that pie? Or should I say "faux" lattice style decoration. The lattice is just leftover crust trimmed into strips and laid across the top, with a little milk wash to help the browning. That was a store-bought crust and since I recall making my own pie dough recently I guess that isn't my first pie this season after all. Oh well, I'll just say that was an end-of-the-summer pie! There's something about the cooler weather that makes me want to bake. This pie kicks off the autumn-winter season: an apple pie with a generous sprinkling of dried and lightly sweetened cranberries. I really enjoyed the way the tart cranberries offset the sweetness of the apples. As usual, no sugar (except the little bit on the cranberries) was required to suit my family's taste. "Ciabatta" is Italian for slippers, the big flat kind you wear on your feet at home. It is also the name of my very favorite rustic Italian style bread, so named because its shape resembles this cozy footware. 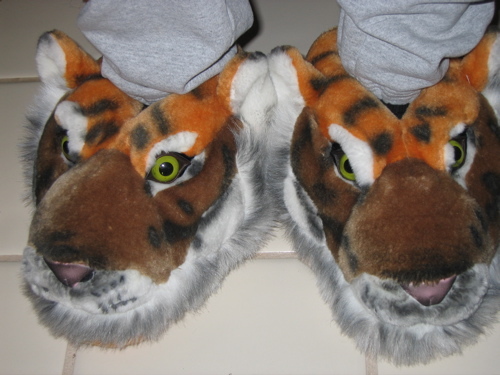 (Note: It probably does NOT resemble the fluffy tiger slippers pictured above, unless you do something seriously wrong while baking it). Ciabatta bread is the one I make special trips to the grocery store for. I eat it plain, sliced and grilled under the broiler with garlic infused butter, by itself or along side a bowl of hearty vegetable soup. God, I love it. I am no stranger to bread making. 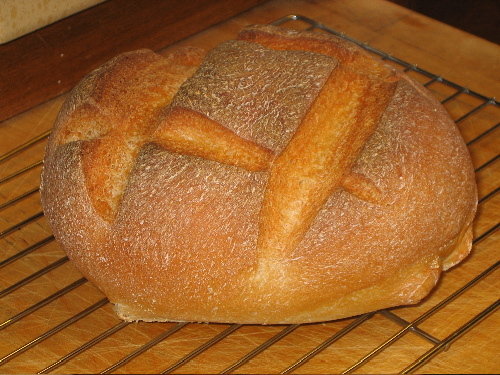 But I wanted to make something other than a basic white or wheat American style loaf. 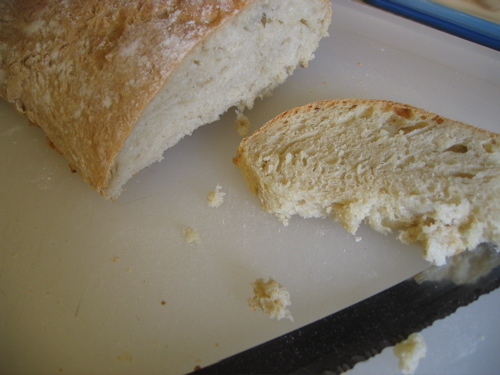 I wanted to make ciabatta bread, and I wanted to make it often--perhaps daily. Then, thanks to Amy of Not As Good As Pork Cracklins, I found this book, with the intriging title No Need To Knead by Suzanne Dunaway. Here was a baker I could relate to. Touring Italy, she fell in love with the rustic breads and sought a way to bake them at home. She came up with a way of making bread that involves using a very wet dough and virtually no kneading. Using her method, she has created a very successful bakery and now in her book she teaches the home baker how to make their own daily bread with a minimum of fuss and delicious results. I can personally attest to the simplicity and delightful results of the no-knead method. If you want to see a brief but instructive video clip of this type of no-knead bread making process in action, hop on over to YouTube, where Mark Bittman hosts a baker demonstrating the technique. My son Evan was so smitten with this ciabatta bread, he asked me to teach him how to bake his own loaf. I sent him back to college with a little baggie of rye four and yeast. For me, Ciabatta is just the beginning! And just in time to prod me along and help me develop my skills, a group of three food bloggers (Seriously Good, KitchenMage, and Farmgirl) have formed a year long web based bread baking project to inspire and guide us all in the quest of creating delicious, satisfying home baked bread. I signed up. How about you? Check it out. To make the BIGA, mix the yeast with the water. Then combine the flours with the yeast mixture, forming a very wet dough. Cover and let stand at room temperature over night, becoming very yeasty. 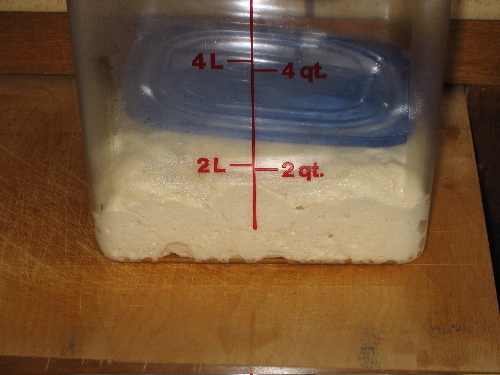 To make the bread: Measure the water into a large mixing bowl, dissolve in the yeast. .Stir in the BIGA. Add the flour and mix until a sticky, soft dough. Cover and let double in volume for about an hour. With a scraper or spatula, fold the dough over on itself two or three times. Cove and let rise again for 45 minutes or until doubled in volume. OR cover and refrigerate until ready to bake (perhaps the next day). When ready to bake, (allow the dough to come to room temperature if placed in fridge), flour a baking sheet witha thin layer of flour, and also your hands. Pour the dough into your baking sheet, and softly pat it into a long flat shape. (About four inches wide and 14 inches long). This is your old slipper shape (no bunny ears or tiger faces required!) Let rise another half hour or so. Preheat your oven to 500 degrees F. Flip the loaf over very carefully for a more even rise in the oven. Bake for 15 minutes, then reduce oven temperature to 450 degrees and bake another 15 minutes until nicely browned. Remove to wire rack and allow to cool completely before cutting. (It is technically still baking while cooling, so be patient). Do I even need to say ENJOY? If I were a group of cookie cutters, where in the Rookie's kitchen would I be hiding? I freely admit it: This cake came straight out of a grocery store box mix. (It was probably Duncan Hines brand). When push comes to shove (i.e., no time to bake from scratch), I will choose a box mix cake over an over priced, but not necessarily any tastier version from the local grocery store bakery section. Sitting on my cook book shelf is a book called The Cake Mix Doctor, which gives you a baziilion ways to modify a cake mix to create special desserts that you would never guess were based on a mix. You can consider this cake my "before" picture, as in "before I read that book and applied one of the techniques." 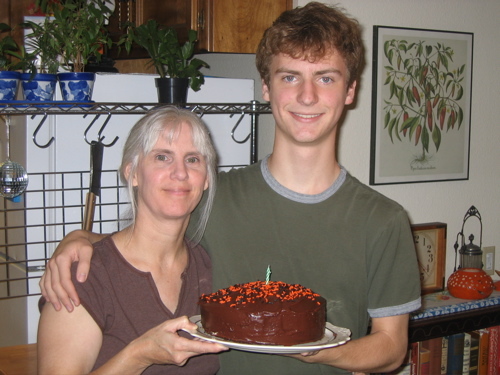 I promise to review future doctored cake mixes here, if and when I get around to it! 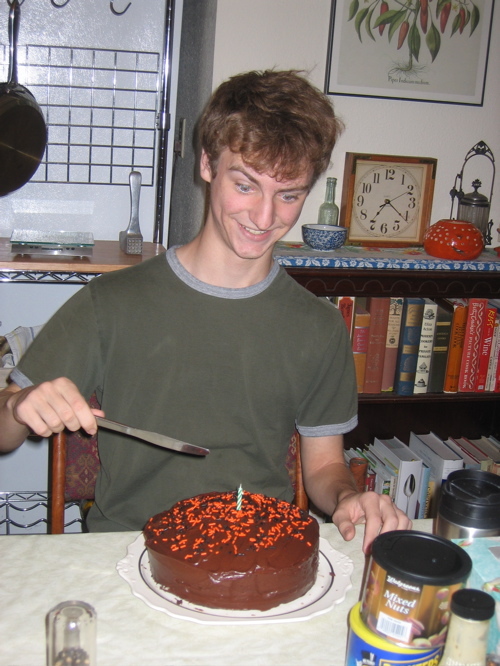 Here's Ethan's 17th birthday cake, complete with orange sprinkles on chocolate because he was born two days before Halloween. I remember sitting on the couch with him, barely 48 hours old, cradled in my arms, getting up only to hand out candy to the trick or treaters that year. Happy birthday to "my little pumpkin!" Cookie Madness has a new web address! There I was, clicking on my own link to Cookie Madness, when I saw that it had been replaced by an erroneous site. I fixed the link! I knew that change was in the works....but it slipped by me. I noticed another of my favorite food bloggers had the old link in her blogroll too. So....Cookie Madness fans--change your blogroll links! Here's a family dinner roll recipe that is a big favorite at our house for the holiday season. The recipe comes from my cousin's grandmother, Stella Cole, and it calls for the use of Kellogg's All-Bran cereal, which adds a delicious nutty flavor to the bread. 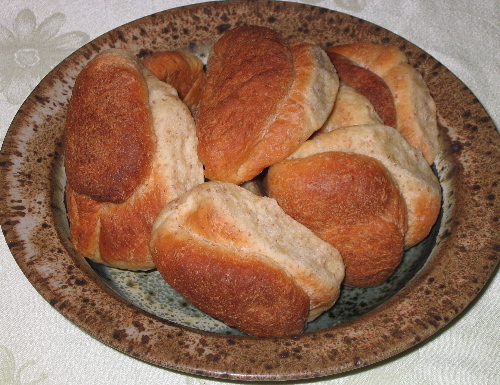 This is a yeast bread with two rise periods, and the rolls are hand shaped into a Parker House Roll style in this version. When I was a kid, my Mom taught me to roll out the dough and cut it into rounds like muffins. Then she folded the rounds into half-circles to get the distinctive creased shape of these rolls. The scraps were re-rolled and cut, making this a labor-intensive method. This year I glanced in the Holiday 2005 issue of Cook's Illustrated Magazine and there was an article by Matthew Card all about the formation of perfect Parker House Rolls. (Note: The whole magazine was really good, well worth purchasing). I recognized the shape and realized that it was probably the "proper" way to make these rolls. The technique involves cutting the dough into small balls with a bench scraper, then rolling each one by hand into a sphere. As you work through the dough, the first spheres have a chance to rest and relax a bit. Then you flatten the sphere with your hand, and using a dowel or wooden spoon handle, roll the dough into an oval, making it slightly flatter in the middle of the oval. Brush the ends with butter, fold, and place on the baking sheet for the second rise. Although it is easier not to have to re-roll scraps and cut like biscuit dough, this method is just as labor intensive but preferable, I think. A final brush with butter before baking makes these rolls so delicious, they will vanish before the turkey comes out of the oven unless a strict Kitchen Patience Protocol is enacted. This is a big recipe but if I am going to do the work, I want to make enough rolls to last more than ten minutes...which is a challenge. Is it worth all the work? My family votes an enthusiastic Yes, but next year I won't bake two pies on the same day! Or better yet, I'll make sure I press my two sons into service. Mix the bran with the boiling water, sugar, salt and shortening. Let stand until the shortening is melted and almost cold. (So you don't scald the yeast when added). Add eggs, and the yeast dissolved in lukewarm water. Add flour, a cup at a time, mixing it into a loaf of dough. Knead until smooth and elastic. 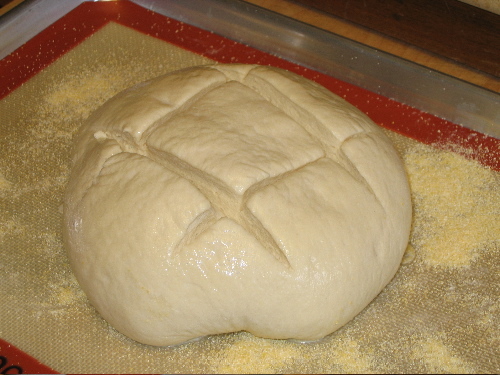 Cover and let dough rise until very light. (double in size is good). Punch down and shape dough into rolls by your preferred method. Place shaped rolls on to prepared (greased) baking sheet, close but not touching one another. Brush with melted butter if desired. Let rolls rise again until very light--up to 2 hours (in warm kitchen time can be much less). Rolls will touch one another after rising, easily pulled apart when done. Bake for 20 minutes (one pan at a time) at 400 degrees. One of my traditions at Thanksgiving time is to bake a family recipe for dinner rolls. However it has been years since I have baked a loaf of bread, and I have recently been inspired by reading "Im Just Here For More Food", by Alton Brown. Alton's new book is all about baking, and he uses an interesting approach whereby he categorizes types of baking by the method in which ingredients are mixed together. Once one understands these few basic mixing methods and how to handle them properly, one can greatly increase the odds of creating a successful product, whether it be through employing the creaming method, the biscuit method, the straight dough method, etc. But first, Alton impresses upon the reader the importance of using a scale to weigh ingredients, as opposed to the American custom of measuring ingredients by volume (seven cups of flour, a cup of water, etc.) 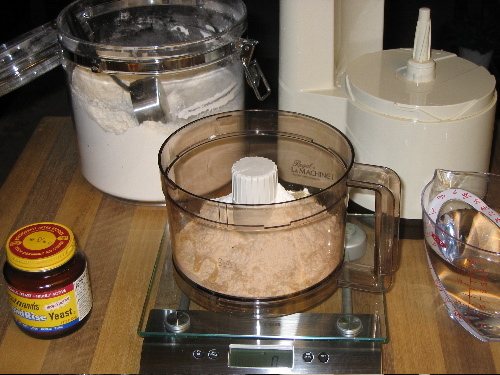 I learned that weighing baking ingredients is the standard practice not only in professional baking, but in most other countries. This is because a cup of flour can vary tremendously in weight and true total volume from cup to cup, depending on how compact it is. Sifting alone will not create a uniform measure, and these variations in liquid to dry ingredients can wreak havoc with the best recipe. In the end, Alton convinced me, so I went out and purchased a digital food scale that will measure the weight by ounces or grams, fluid ir dry, as one selects. It also has a tare function, so that I can place a bowl on the scale and set it to zero before adding and weighing the contents. This took some getting used to, and I made a few mistakes in adding ingredients consecutively in another project that same day. Once my ingredients were mixed, I again took Alton's advice and went for a long, slow, cold rise in the refrigerator all night. This creates a sponge which adds a great deal of flavor to the final result. The next morning I kneaded the dough by hand, since I do not own a mixer with a dough attachment. Let it be said that I sincerely enjoy kneading bread. I enjoy the physical rhythm of it, and getting a good feel of what is happening with the dough as it developes the proper stretchy and springy texture. This is the physical action that helps gluten formation and the distribution of yeast throughout the loaf, giving it better flavor and texture. But let it also be said that kneading dough long and vigorously enough to create a truly well developed doough is hard work. I went at it for a good half hour, and applied the "windowpane" test, wherein I stretched a small portion of dough between my fingers to see if I could form a membrane, thin and similar to bubble-gum. I finally determined that I was close enough, and let the dough rest and rise for its final bench proof. I slashed the top of the raw dough, (Alton says it gives it room to expand while baking), and I also tried Alton's recommendations for placing a pan of water in the oven (for humidity), as well as a clean, upended and unglazed terra cotta planter plate as a baking stone for the loaf itself. The results were spectacular, ladies and gentlemen. The bread crumb was even, dense but not too chewy, and the flavor was delicious. I used organic white unbleached flour this time, but a bag of whole wheat is waiting in the pantry. 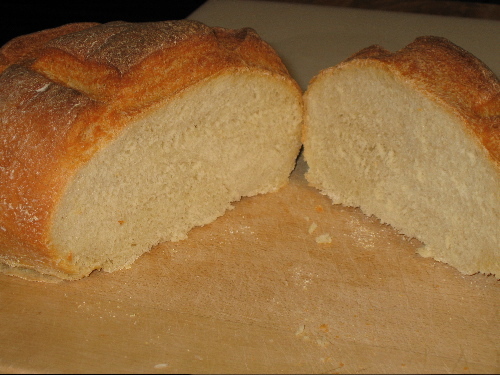 I pored over Alton's book, took his advice about yeast, equipment, ingredients and method, and came up with the best loaf of bread I have ever made. And although each future loaf will receive personal attention and kneading, I am looking seriously into buying a new stand mixer that can improve my efficiency and baking frequency. I look forward to experimenting with starters and sourdoughs next.